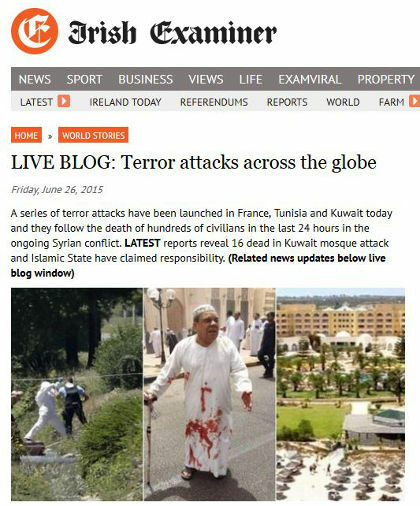 Terrorists have killed over 40 people today in attacks conducted in France, Tunisia and Kuwait. It is still not clear whether all three attacks from today were related/co-ordinated and if they were all conducted by ISIS, their sympathizers or some other Islamic terrorist groups. But ISIS did play a role and the aftermath of these attacks is being felt around the world. In France, two men drove a car into the premises of a factory near Lyon and triggered multiple explosions and injured two people. A decapitated head covered in Arabic writing was also pinned to the factory’s gate. One of the Muslim (Salafist) terrorists has reportedly been arrested as French authorities are on the hunt for accomplices. The Islamic State (ISIS) claimed responsibility for the bombing of a Shia mosque in Kuwait City which has already claimed 13 victims with another 25 wounded. A suicide bomber (claimed by an ISIS related group to be Abu Suleiman al-Muwahhid) entered the Al-Imam al-Sadeq mosque and created the devastation during Friday prayers. The third mass terrorist attack of the day came at a sea side tourist resort in Tunisia. Two Islamic terrorists attacked the mostly German and British tourists at two hotels in Sousse and killed 27 as panic struck the resort’s beach and hotels. One of the gunmen is reported to have been killed while the other was still being sought by Tunisian security services. ISIS has publicly called for its followers to turn Ramadan and into a time of “calamity for the infidels” (Muslims around the world have just recently started celebrating their holy month of Ramadan). While world leaders will give lip service to the horrors from today, many of the countries, their rulers, religious leaders and power brokers that are deeply involved in sustaining this radical Salafist ideology will likely continue to have their complicity swept under the rug.